This is the biggest Wheel Chair user gathering and conference with an expected Wheel Chair delegate count to be more than 500 at a single location, along with policy makers. Entry to this event is Complementary based on Pre Registration supported by Generous Donors and CSR. Remark: Please provide your address in the comment section. 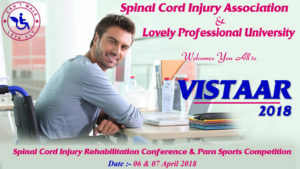 Such conference should help to upgrade life of sci person. From few days conference sci person will be able to get life long crucial knowledge about self care, bowel bladder and bed sore management, sexuality and so on. Seniors, expertise experience will be another important and international experience as well. Can’t be there physically. Will this be available online to watch?